I mentioned in a post today an ETF that owns an assortment of Closed End Funds : PowerShares CEF Income Composite Portfolio (PCEF). I do not own that fund. This article in Seeking Alpha contains a good discussion of the advantages and disadvantage of this ETF. The reason for this post is just to mention to anyone interested the existence of a CEF that invests in other CEFs. The Cohen & Steers Closed-End Opportunity Fund (FOF) is a Closed End Fund that owns other CEFs. While the fund expense ratio is higher than PCEF, this CEF does trade at a discount to its NAV. As of the close of trading yesterday (4/29/2010), the discount to NAV was 8.24%. WSJ.com Distributions are paid quarterly. The distribution yield was around 7.33% annually based on yesterday's closing price and the current dividend rate of 23 cents per quarter. FOF is a more balanced fund than PCEF in my opinion, and is less bond heavy. This is apparent looking at FOF's portfolio: 2009 Annual Report Filed With the SEC I do not own it, but would consider buying it just to see if it outperforms my personalize collection of CEFs. If I own something, I pay more attention. PCEF and FOF will end up holding CEFs that trade at a premium to NAV. I will not buy a CEF trading at a premium. Instead, my strategy for CEFs is to buy mostly at large discounts and to pare when the CEF trades near its NAV or at a premium. I also prefer CEFs with lower expense ratios and frequent dividend payment schedules. This is a link to the CEFA - Closed-End Fund Association- page on FOF. Morningstar rates it 4 stars. 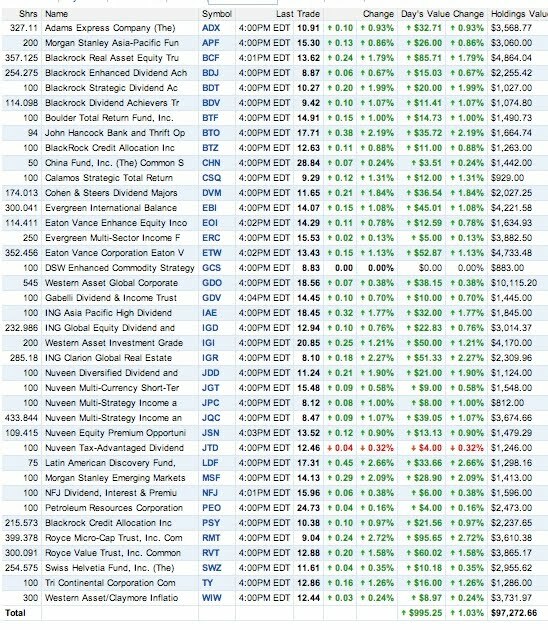 The preceding table reflects transactions in the Closed End Fund strategy since I lasted posted the table. It has to be clicked in order to read it. This is basically a balanced portfolio of CEFs. It contains both stock & bond funds, domestic and foreign. Then, this mini-portfolio has sectors within those broad classifications such as TIPs, natural resources and real estate stocks, buy-write option income funds, and high yield bonds. In effect, I am trying to achieve a balanced portfolio, similar to what Powershares is attempting to do with a recently launched ETF of CEFs: PowerShares CEF Income Composite Portfolio (PCEF). I do not have to charge myself a fee, however, for assembling this portfolio. PCEF has a .5% management fee, which is on top off the expenses for the owned funds. I would not have a problem owning PCEF as an alternative to what I am doing, but I prefer to select my own CEFs, and to follow a different strategy. There is some overlap in my holdings and the current ones for PCEF: Holdings While I own bond and buy-write funds, I prefer to emphasize more plain vanilla stock funds, both internationally and domestically. I have been investing in CEFs since around 1983. When I started, there were just a few of them. Some of the more prominent ones back in the early 1980s were started during the 1920s, such as Adams Express and Tri-Continental, and managed to survive the Great Depression and the stock market crash. The ones that failed used leverage, and the owners of those leveraged funds found out the hard way that leverage works both ways. I started only recently to add bond CEFs. This was in part based on the realization, based on what appeared to be overwhelming evidence, except to the LB, that I was no longer a 16 year old Stock Stud. I am emphasizing bond funds that have a term date, which lessens in my view the interest rate risk inherent in bond funds. Bond funds do not have a maturity date. This is a very important and obvious point, which many individuals will learn the hard way when interest rates start to rise. 1. HF Financial (HFFC) (own Regional Bank Strategy): This is one of the smaller banks in the basket of regional banks, and apparently only one analyst covers it. HF Financial Corp reported earnings of 1.8 million for its 3rd fiscal quarter (3/31/10) or 26 cents per share. The tangible book value was $12.79, or greater than the current share price. The total risk-based capital to risk-weighted assets was 11.72%. Tangible common equity to tangible assets was 7.22%. Net interest margin was 3.32%. 2. Corning (GLW)(owned-2010 Speculative Strategy): Corning reported 1st quarter earnings of 52 cents on sales of 1.55 billion. This beat the consensus estimate by 10 cents. Gross margin improved to 47% from 42% in the previous quarter. 3. BNC Bancorp (BNCN)(Regional Bank Stocks strategy): BNC Bancorp reported first quarter earnings of 12 cents per share. NPLs as a percentage of total loans was 2.04%. This bank recently completed an FDIC assisted acquisition that extended its geographic service territory in Eastern North Carolina into the coastal region of South Carolina, primarily in the Myrtle Beach area. 4. ConocoPhillips (COP)(own)(Natural Resource Overweight Strategy): ConocoPhillips reported 1st quarter earnings of 2.1 billion or $1.4 per share (adjusted at $1.47). Cash from operations for the 1st quarter was 3 billion. The consensus estimate was $1.36. Downstream operations recorded a loss of 16 million. 5. Exxon (XOM)(own)(Natural Resource Overweight Strategy): Exxon reported earnings of $1.33 per share, missing expectations by 8 cents, and significantly missed the revenue estimate of 96.41 billion by reporting "just" 90.25 billion. Six billion to the U.S. government is not even a rounding error. Chemical earnings increased 257% from the year ago quarter. U.S. refining continues to be a drag, recording another loss. 6. Currency Risk of Foreign Stocks and Bonds: This article from Morningstar explains the currency risks in owning foreign securities. 7. Unilever (own): I still own shares in Unilever bought at 18.05 on 3/23/2009. I have no intention of selling them, viewing that price as a good long term entry point. Unilever (UN, UL) reported a net profit of €1.055 billion on a 6.7% in sales. www.unilever.com pdf Earnings per share came to €34 cents up from €25 cents in the year earlier period. Net cash flow was €666 million. The second quarter's dividend will be increased by 6.7% over the first quarter. Excluding currency fluctuations and acquisition, sales increased 4.1% year-over-year. A discussion of this report can be found at MarketWatch. 8. AT & T (own senior bonds and common): I believe the IPhone was introduced around June 2007. AT & T was selected by Apple to be the exclusive service provider in the U.S. While I do not want to be unfair to AT & T, or to be excessively judgmental, I think that it would be fair to say that the IPhone has been more important to Apple than to AT & T. RB just said that the LB is both overly judgmental and critical. Lighten up Dude, the RB purred. On June 29, 2007, AT & T closed at $41.5 or about a 37% decline in the stock price since the IPhone introduction. AT&T's first-quarter results were okay. Excluding a 17 cent charge related to the health care legislation, the adjusted E.P.S. was 59 cents compared to 53 cents a year ago. AT & T added 1.9 million net new wireless subscribers. The postpaid adds were relatively weak, however, at 512,000, representing a 40% decrease from a year ago. The company used some excess cash to pay down debt during the quarter. 9. Bought 50 ADM at $28.05 (See Disclaimer): ADM almost qualifies for the dividend growth strategy. I looked at the historical data at VL which starts in 1994 for ADM. The dividend has been increased in every year except for 1999. The current annual rate is 60 cents per share, up from 32 cents in 2005 and 16 cents in 1997. The payout ratio is low, hovering around 20% to net profits, so there is room for better dividend growth. The current dividend yield is, however, too low as the starting point for stocks in the dividend growth strategy. This simply means that I am not likely to be a long term holder of ADM. I placed it in a satellite account where the primary focus is capital preservation by investing in CDs. I will therefore sell the shares on a pop. 10. Bought 200 SFH in the ROTH IRA at 10.18 (see Disclaimer): This is sort of a principal protected note, with some downside protection as explained below. The issuer is Bank of America and it matures on 12/5/2011. It is automatically callable on an observation date if the S & P 500 closes at or above the starting value of 1105.65 on any of the three observations days. The S & P 500 closed yesterday at 1206.78 ( ^GSPC) The next observation date is 11/29/2010. If the S & P 500 closes on that date at or above 1105.65, Bank of America has to call the note and pay me $10.955. So, this is hopefully going to happen. I would call this attempting to get on base with a bunt or possibly refusing to move when the fastball is about to graze the jersey. The next observation date after 11/29/2010 is 5/25/2011. And if the index is above the starting value on that date, Bank of America will have to pay $11.433. The last observation date is 11/28/2011. If the index is above the starting value at that time, BAC has to pay $11.91. I said that this was sort of a principal protected note. What happens if the S & P 500 index does not close on any of the three observation dates above the starting value of 1105.65? Then, I will receive on the maturity date $10 provided the S & P 500 closes above the "threshold value" of 995.09. So, this security is principal protected above the Threshold Value. I start to lose the par value with lower closes on a 1 to 1 basis. The example given in the prospectus is an ending value in the S & P 500 at 939.8, a 5% decline from the Threshold value, which would result in a payment of just $9.5 at maturity. So, this one has limited principal protection and a capped upside. The main benefit now is the S & P is well above the starting value of 1105.65. If it stays above that value on the first observation date, which is what I hope, I will receive about a 7.5% return even if the S & P 500 declines 100 points from its close yesterday at 1206.78 by the first observation date in November 2010. And that return would be realized under those circumstances in about 7 months. Given the small profit spread, I would not pay anymore than $10.18 for this security. If I miss the first two observation dates and hit the third and last one, the return would increase to about 16.8% but the holding period would be 1 year and seven months. So, I would be happy with the 7.5% in seven months. This is a link to the prospectus: Final Term Sheet 202 I personally would not hold this security in a taxable account given the uncertainties set forth in prospectus about the tax treatment. There were several similar notes that I was considering to buy. SFH was the only one that had some volume yesterday. And, I would caution that the elevator on the way down is a lot faster than the one going up. This security would be more interesting to me if it missed the first two observation dates, but not by much. Then, if I could buy at a price near par value, then I would have only to wait about 6 months before conceivably receiving the highest amount on the final observation date. These notes are unsecured obligations of the issuer. Anyone who buys them is subject to the credit risk of the issuer, as the owner of similar securities issued by Lehman found out the hard way. While I sympathize with their plight, it is impossible for me to understand their arguments, made in some lawsuits brought against brokers who sold them the Lehman notes, that they were unaware of the credit risk. If they were unaware, then they were negligent. It only takes a second to review the prospectus before you see language that these types of securities are unsecured obligations of the issuer. They are not CDs covered by FDIC insurance. (some banks do offer CDs whose interest is linked to an index: Index Linked CDs) If BAC is seized by the FDIC, I would become just another unsecured creditor in bankruptcy court as the owner of SFH, though I believe that I would be senior to the owners of the trust preferred issues which might get me a few cents on the dollar in a worse case scenario. 11. Sold 100 of the 457 shares of the CEF BCF (Natural Resource Overweight & CEF Strategy) (See Disclaimer): I like this CEF, but it is another one whose price is currently at a premium to its net asset value. I therefore sold 100 shares of BCF in the Roth IRA. My strategy for CEFs has always been to buy at discounts to NAV, mostly over 10% for stock funds, and to sell or pare when the discount narrows or rises to a premium to net asset value, when that phenomenon occurs in a rising market for stocks. Then, I would be making money in two ways: a reduction in the discount and the rise in the NAV due to a bull market in stocks. 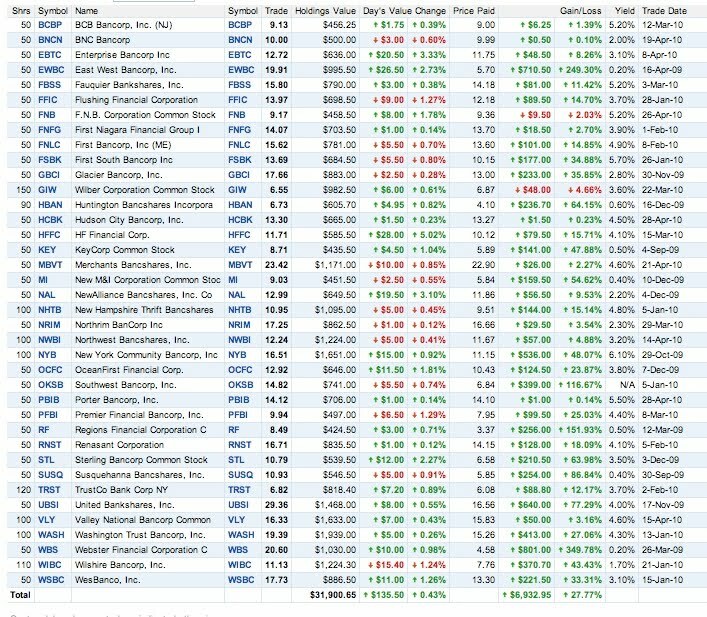 BCF closed yesterday at a 2.02% premium to its NAV on 4/29/2010: WSJ.com. Some of these natural resource funds have been dinged, particularly yesterday, by owing BP and Transocean, both involved in that oil spill in the Gulf of Mexico. 12. VIX: The ^VIX recovered yesterday from its brief foray above the 20 demarcation line and fell 12.52% yesterday to close at 18.44. The recent dominant trend still suggests that a Stable Vix Pattern may be forming and I am continuing my 3 month count as if there was no brief excursion above 20. Again, my primary use of the Vix Asset Allocation Model is to alert me to change my allocation to stocks when there is a Trigger Event that disrupts a long-standing Stable Vix Pattern. I am now using it to make an estimation of the likelihood of the sustainability of the current bull move for several more years. Under the model, this requires the formation of a Stable Vix Pattern at the end of the Unstable Vix Pattern. We have been in an Unstable Pattern since August 2007. Once the VIX moves for 3 months ( call it 66 trading days) below 20 without a significant disruption of that pattern, then I would declare the formation of a Stable Vix Pattern, which historically would mean a continuation of the bull move for several years, though the time period is mushy. The bull move as defined in the model continued for about 6 years after the formation of the Stable Vix Pattern in 1991 and almost 4 after the 2003 Stable Vix Pattern formation. 12. Goldman Sachs-Investigation of Possible Criminal Charges: The WSJ and the NYT are reporting that Federal prosecutors are conducting a criminal investigation of Goldman Sachs. The matter was referred by the SEC and involves mortgage trading. This may result in nothing happening. It is not unexpected, though the market will probably act surprised today by the news. Needless to say, the phrases "investment bank" and "criminal investigation" do not go well together. The matter was referred to the Justice Department by the SEC one day after 62 House lawmakers forwarded a petition to Justice requesting a criminal investigation. This continues the political theme of the investigation. I may need to decide whether GYB and PYT, two synthetic floaters tied to a GS TP and held in retirement accounts, are currently consistent with the conservative management strategy for those accounts, at least until the smoke clears. One factor that helps in the decision making process is that no taxes have to paid on gains in those accounts. I do not have a problem holding JBK and PJI in the taxable account where I am willing to assume more risk. I do not believe that I will ever need the funds in the retirement accounts. If I ever do, then those funds will certainly need to be there. I have good unrealized profits in most of GS bond positions in the IRAs. I had more trades which I will try to remember to summarize in the next post. This post is long enough already. The buys included 50 shares of a bank TP at $23.2 and a foreign pharmaceutical stock. Some sells were made in some securities that had not moved, and LB ran out of patience. Actually, RB just said that the LB has no patience, so it could not run out of something that it has never had. RB's explanation is that Mr. Tunnel Vision is at its core a trader that just kicks up a lot of dust. The LB replied that Mr. Lame Brain may have a point. LB is not know for its patience. Instead, those sells were made as part of a dynamic allocation process of Headknocker's capital, moving from one group of stocks that had not shown the desired movement to other securities, which at least pay income, such as the TP and foreign pharmaceutical stock. A few readers are interested in this table, and it has to be clicked to be readable. This table reflects recent transactions in the regional bank basket strategy, including yesterday's purchases and the recent disposal of SNV. For stocks where there has been more than one purchase, I use a weighted average cost and the last transaction date as the trade date. I may not post this table again. I am tempted to take some profits in those names where the dividend is just 1 cent per quarter. LB wants to sell all of the names in Category 1. If my count is correct, this basket now has 38 names. The value fell a few hundred dollars from my last post of this table. 1. Bought 50 HCBK at $13.27 (Cat 2- Regional Bank Stocks) Hudson City has fallen some after reporting earnings a few days ago. Apparently, the market was not pleased with the non-performing loans increasing to 2.32% of total loans and a small decline in the net interest margin to 2.2%. Hudson City Bancorp, did report diluted earnings per share of 30 cents. The total risk based capital ratio was 21.24% as of 3/31/2010. The consensus estimate is for $1.16 in earnings in 2010 and $1.29 in 2011. This article from TheStreet.com attempts to make the case that Hudson is a standout value among regional bank and thrift stocks. As a result of the recent price decline, the yield at a total cost of $13.27 is around 4.5%. Porter reported 30 cents per diluted share in earnings. Based on the information at Reuters.com, this beat the consensus estimate by seven cents. The provision for loan losses was 3 million. NPLs decreased during the 1st quarter by 24.4 million compared to the Q/E 12/31/2009. Net interest margin increased 30 basis points to 3.32%. The allowance for loan losses to NPLs is only 43.9, which I view as a potential negative. And the NPLs to total loans is very high at 4.44%. The ratios still look okay, with the total risk based capital ratio at 14.12%, the tier 1 risk-based capital at 12.2%, and the leverage ratio at 9.24%, all as of 2/31/2010 and in excess of the minimum levels for well capitalized banks. The current consensus estimate for earnings in 2010 is $1.28 and $1.77 in 2011.: PBIB: Analyst Estimates for Porter Bancorp, Inc.
3. MYP (OWN): This principal protected note was ex distribution yesterday for its annual guaranteed payment of $30 for 100 shares. 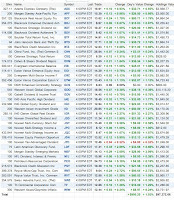 Bought 100 MYP at $10.12 This will be shown at the WSJ.com dividend page until late this afternoon. 4. Bought 100 CBO.TO AT 20.4 CAD and 100 shares of CPD.TO at 16.09 CAD (see Disclaimer): These purchases are part of my ongoing effort to achieve some yield on my Canadian dollar position. I am willing to accept the currency risks inherent in owning securities denominated in Canadian dollars, realizing that there will be many times when an adverse currency exchange will wipe out the value of the dividends paid by securities whose distributions are paid to me in the Canadian currency, until that change reverses. The Canadian dollar and the U.S. dollar are near parity now. Since I am a long term holder of Canadian dollars, I am not personally concerned about changes in the exchange rates, which will cause significant fluctuations of the securities owed by me and priced in Canadian dollars. I am more interested in just earning a return on my Canadian dollar position, which led me to the purchases of 4 Claymore ETFs traded on the Toronto exchange. One purchase yesterday was the Claymore 1-5 Yr Laddered Corporate Bond ETF ( CBO). For this kind of buy, I have some credit and interest rate risk, but view the currency risk to be more important. The corporate bonds in this ETF appear to be largely from blue chip Canadian companies. Claymore 1-5 Yr Laddered Corporate Bond ETF - HOLDINGS. The portfolio is diversified by industry sector and by the number of bonds (25). Personally I would like to see about 10 to 15 more. The management fee is .25%. I am protected in some measure from interest rate risks due to the short duration of the bonds and the roll in maturities. Dividends are paid quarterly. The current yield is around 4.7%. The other purchase yesterday was the Claymore S&P/TSX CDN Preferred Share ETF (CPD). This one has 66 securities currently. The distribution yield is shown to be 5.21% the the price paid yesterday. The management fee is .45%. Dividends are paid quarterly. This is the link to the holdings: Claymore S&P/TSX CDN Preferred Share ETF - CPD - HOLDINGS I suspect that these preferred stocks are what I would call equity preferred, but have not confirmed it. I base that observation on Claymore's description of them. The top holding is a TransCanada Series 1 preferred stock which trades on the Toronto exchange: TRP-PA.TO I do not know whether or not the dividends will be taxed to me as qualified dividends, and possibly I will know the answer to that question early next year. This particular ETF is heavy into preferred stock issues from Canadian banks and insurance companies. As of 4/27/2010, the discount to NAV was 12.2%, when the NAV was $27.96 and the closing price that day was $24.55. Petroleum & Resources Corp. 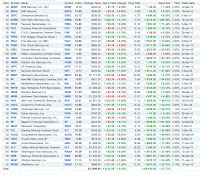 This is a link to it 2010 1st quarter report: peteres.com/.pdf As of the end of the last quarter, the largest holdings include Chevron at 10.8% of net assets and Exxon at 10.3%, followed by Occidental, Noble, Transocean, Halliburton, Apache, XTO, Freeport-McMoRan Copper & Gold and Noble Energy. This is the link to the PEO page at the CEFA - Closed-End Fund Association. The discount to NAV expanded some yesterday to -12.51. 6. Santander (own common STD and floating rate equity preferred STDPRB): STD continued its decline yesterday after S & P downgraded Spain's government debt one notch and kept Spain's credit rating on negative outlook. STD recovered, however, by the end of the day. Spain's debt was downgraded to AA from AA+. S & P is anticipating a protracted period of sluggish economic activity in Spain, which is probably an obvious point. Most of the accelerated growth in Spain prior to 2008 was due to an improvident extension of credit, fueling a housing bubble. It was just a smaller version of what happened in the U.S. I simply view STD as hostage now to the rapidly deteriorating situation in Greece, and the fear of a contagion effect. Yesterday, the two year Greek government debt hit 24% intra-day. This was either a selling climax or the market is correctly anticipating a default. I continue to like the long term story at STD. A discussion of this report can be found at MarketWatch. 7. SUSQ (own-Regional Bank Stocks): Susquehanna Bancshares reported a profit for the 1st quarter of 2010, earning 4 cents per diluted share versus the consensus expectations of break-even: SUSQ: Analyst Estimates for Susquehanna Bancshares When I purchased SUSQ at $5.85 last October, I placed those shares in Category 1 of my regional bank strategy, a category reserved for what I viewed as the most speculative stocks in this basket. Another common factor for the banks in that category was the reduction in the common share dividend to 1 cent per quarter. This last report from SUSQ keeps that stock on the borderline between Category 1 and 2, leaning toward a promotion to CAT 2 . I had the same reaction to its 2009 4th quarter report. Item # 2 SUSQ Susquehanna is certainly making more progress than some of the other banks in CAT 1-at least it is reporting a profit. 8. Bought 50 EUO at 21.73 (Long/Short Strategy-Short Europe)(see disclaimer): This is my second entry into this double short for the EURO, and a small number of shares were purchased near the close yesterday. Who knows what will happen? If Greece receives the money it needs, I will probably sell EUO, most likely for a loss. Otherwise I want to have it around as a very small hedge for a currently unanticipated substantial decline in the European currency due to Europe failing to solve its problems. I previously bought this ETF. Bought 50 EUO at $17.17 as a Hedge I mentioned in that post from November 2009 that it appeared to me the EURO was overvalued against the U.S. dollar and had formed a double top. Now, I do not even have an opinion on whether or not the bottom is in yet. 9. Dividends and Interest: Chevron, Exxon, Marathon raised their dividends yesterday. Exxon raised its dividend by 2 cents per quarter to 44 cents. Marathon Oil (MRO) raised its quarterly dividend by one cent to 25 cents. The HRP Properties senior note, HRPN, is ex interest today for its quarterly payment.Bought 100 HRPN at 19.32/ Added 100 HRPN AT 19.15 The two exchange traded bonds from Delphi Financial, DKP and DKY, were ex interest for their quarterly distributions yesterday. The downdraft in the markets yesterday came soon after S & P cut its rating of Greek government to debt to junk. Portugal's debt was cut by two notches. The Greek government debt was reduced by S & P to BB+. In a recent post, I mentioned that the only long term solution for Greece is to give 60% of its citizens a brain transplant. Greece Well, I hit that number on the head. A poll yesterday found that 60% of the Greeks believe that they do not have a problem. Tech Ticker Strikes to protest the austerity measures are scheduled for May 5th. After the downgrade yesterday, the cost for credit default insurance rose to $800,000 a year to insure 10 million of Greek debt for five years. I would agree with Senator Levin on at least one of his points made yesterday. The creation of synthetic CDOs magnified the financial credit crisis. MarketWatch These abominations need to be abolished, notwithstanding the protestations of the Masters of Disaster about interfering with their "innovations". The short Europe part of my long/short strategy worked yesterday. EPV was my best performer yesterday, rising almost 10% to close at $22.54. ProShares ETFs: UltraShort MSCI Europe – Overview This move just brings me back to break-even though. Yesterday, the fear trade from the Near Depression period returned, with the U.S. dollar, the Japanese Yen and U.S. treasuries gaining strength and most other asset classes losing value. If this continues, it may create another opportunity for me to hedge my long corporate bond exposure with TBT, which I no longer own, after LB sold that insurance for a quick profit. The escalating problems in Europe highlight that there is no real mechanism to prevent one or more EU members from undermining the EURO currency. I may go back to my short on the Euro with a small buy of EUO (Bought 50 EUO at $17.17 as a Hedge). While the reluctance of Germany to bail out the Greeks is understandable, the more probable than not scenario is that Greece will be bailed out by the IMF and the more responsible EU nations after Greece agrees to the IMF's terms. The stakes are just to high to allow the Greek contagion to spread, threatening the viability of the EU and their common currency. A recent poll showed that 57% of the Germans were against bailing out the kleptocracy. In his Barrons column Randall Forsyth summarizes the estimate made by two Citigroup economists on the stock market impact from two potential tax changes. If Congress does nothing on the dividend tax rate, and the top tax rate then reverts back to 39.6% (the rate in effect prior to the 2001 return), and given the 3.8% additional Medicare tax on investment income starting in 2013, the Citigroup economists estimate that those two changes will reduce the present value of U.S. stocks by 10% to 15%. The 3.8% new tax on investment income is intended to help fund the cost of the Democrat's welfare plan for health insurance and would apply to interest, dividends, annuities, royalites, capital gains and rents for individuals earning more than $200,000 and joint filers earning more than $250,000. National Center for Policy Analysis CBS News MSN Money (also includes gains on the sale of a home for high earners: FactCheck.org) A good analysis of the wealth redistribution aspects of "health reform" can be at The Tax Foundation - Health Care Reform: How Much Does It Redistribute Income? The NYT reporter covering the GS flagellation yesterday noted that the Fabulous Fab admitted that GS never wanted to keep part of the Abacus deal, but was just stuck with it (see reference after 2:59 p.m.). Now, if Congress would recognize their own culpability, and give themselves some of the same treatment, I would pay for admission to see it.
" There was a similar interruption in the formation of the Stable Vix Pattern in 2003, which is allowed without starting the count over, provided the VIX soon returns to below 20. The movement above 20, starting in September 2003, lasted for 7 days, and then the dominant pattern of movement under 20 reasserted itself. However, this movement never got above 23 and was short lived. If the VIX closed over 25, I would restart the count. If it did not return to below 20 soon, I would restart the count. I do not recall what spooked the market in September 2003 to cause a short duration spike into the low 20s. The VIX closed at 17.54 on 9/23/2003. By 9/25/2003, it hit 22.26, similar to what happened today based on the fear that Europe was about to collapse, causing the world to fall into a black hole of financial destruction or so it would seem. "By mid July 2003 I would be encouraged by the duration of the moves below 20 and the brief movement into the low 20s and no higher. I will start my three month count, not knowing what is about to happen, on August 8 2003. I will disregard the closes in the low 20s in late September/early October numbers as meaningless noise in the overall pattern developing which is clearly a dominant Stable VIX Pattern of continuous movement below 20. So I will start the Stable VIX Pattern Start Date as of 11/10/ 2003. A few weeks sooner would be okay given the steady movement below 20 most of the time in June and July." So, this does require some interpretation. But I would not personally allow any interpretation if the VIX closes near 25 or does not resume steady movement below 20 soon" "
If the VIX continues to spike, closing in the high 20s, then I will have to infer that the developments in Europe are more serious than I now believe to be the case. This would lead me to pare some long positions. There are a few whiffs of possibly significant repercussions. Besides the sovereign debt downgrades, there was a recent failure of a 30 year German bond auction. WSJ.com And there was a near failure of an Italian government auction of short term debt: WSJ.com Italy auctioned €9.5 billion in six month bills and received bids for €9.78 billion. 2. DuPont (owned): DuPont reported a E.P.S. of $1.24 for the 1st quarter of 2010, up from 54 cents in the prior year, beating the consensus estimate by 16 cents. Sales were 8.5 billion, representing a 23% increase from the 1st quarter of 2009. This beat the consensus forecast of 8.06 billion. Volume in the Asia Pacific region was up 65%. DuPont forecasted that its sales of photovoltaic supplies to increase from 550 million in 2009 to in excess of 2 billion by 2014. Forbes. The company raised guidance for 2010 to a range between $2.5 and $2.7. The company also expects free cash flow to be 200 million higher than previously forecasted by it. DD was bought at $16.68 on March 6, 2009. Since my dividend yield at that cost is close to 10%, I have stated previously an intent to keep those shares, held in the Roth IRA, for as long as DD maintains the dividend. 3. Case Shiller Index: For the first time since December 2006, the Case Shiller index of home prices turned positive year-over-year. .standardandpoors.com .pdf Home prices are still 30% below their May 2006 peak. 4. Apollo Investment Corporation (own): One of the problems with Business Development Corporations is their frequent offerings of common stock. During the recession, it was not unusual for several firms to offer common stock priced below net asset value. I currently own 150 shares of AINV. I view BDC's as a disfavored asset class and consequently will trade my positions and keep the positions relatively small. I also own 150 shares of PSEC. 5. Bought 50 STD at $12.35 (see Disclaimer): I was surprised that my limit order to buy 50 shares of STD was filled yesterday. When I entered the order, STD was trading much higher, but continued to decline into the close to hit my limit. Banco Santander declined 7.22% yesterday. As far as I can tell, this was due solely to the negative developments in Europe rather than any adverse news about Santander. The stock is ex dividend today. The purchase yesterday is an average down from my recent purchase at 13.35 and brings me up to a round lot of 100 shares. 6. Southwest Bancorp (OKSB) (own- Regional Bank Stocks strategy): Southwest Bancorp priced its stock offering at $12.5 per share. OKSB gained back yesterday most of what it lost after OKSB announced its intent to sell stock rising 9.14% to $14.93 in trading yesterday. 8. NAL (own-regional bank stocks): This one was Cramer's contribution to the Regional Bank strategy. I am lukewarm on it. NewAlliance reported earnings per share of 17 cents. That amount included a 2.6 million dollar gain related to tax-exempt life insurance proceeds which I would exclude from consideration. Without that gain, NAL reported earnings of just 14 cents. Briefing.Com calls it a 1 cent beat since the analysts were at 13 cents, so the consensus number of 13 cents probably does not include the extraordinary gain from those life insurance proceeds. Net interest margin was only 2.97. I view that number as mediocre. The NPLs to total loans increased to 1.35%. The allowance for loan losses as a percentage of NPLs was 83.47. The total risk based capital ratio was 21.03% as of 3/31/2010, which is the highest that I have seen to date. The Tier 1 leverage capital ratio increased to 11.34% from 11.05% as of 12/31/09. The Board declared the regular quarterly dividend of 7 cents per share. 9. EWBC (own- Regional Bank Stocks-Cat 2) East West Bancorp beat expectations by 6 cents per share, reporting earnings of 13 cents per share. The bank guided the 2nd quarter earnings to a range of 13 to 17 cents, and the consensus was for 13 cents. EWBC was not exactly generous with its payout when times were good. The annual dividend was kept at 20 cents for 2003, 2004, 2005 and 2006 and was raised to 40 cents annually for 2007-2008. The dividend is currently 4 cents annually. This history is viewed negatively. Prior to 2008, the payout ratio to net profits hovered in the 10% to 15% most of the time. This is also view negatively. I have very large percentage gains in EWBC and WBS. I would expect WBS to be more investor friendly on its dividend policy during favorable economic times. So I am inclined to keep WBS and to sell EWBC. Both positions are currently unrealized long term capital gains. EWBC was trading up over $20 in late night trading yesterday. I have, however, not reached a decision. And Senator McConnell (R) continues to grossly distort the reasons for the 50 billion fund in the financial reform bill, calling the fund an incentive for banks to engage in risky behavior knowing that they would be bailed out again. NYT This is at best a knowing misrepresentation about the purpose of that fund, which would be funded by the banks, and used to wind down the affairs of a seized bank. The only explanation for his comments is that he protecting those financial institutions from the levy, rather than the purported rational of preventing another taxpayer bailout. Maybe the Senator from Kentucky needs to think for a second about what happens when the bank is seized. It is invariably a bad day for top management, the shareholders, and the owners of unsecured bonds. Nothing is gained by them. All would be punished for the improvident risk taking. According to McConnell, the orderly wind down of a large financial institutions is viewed as encouraging unwarranted risk taking? All of the republicans voted against starting debate on the financial reform legislation, effectively preventing the bill from advancing to a vote. NYT This is to be expected. One thing is clear. Both political parties are so fed up with the bailouts that the European burden sharing policy will look good to the owners of U.S. bank Trust Preferred issues, when the next financial crisis arrives and it will come again. If I am sufficiently compos mentis to sniff out another approaching 2008 financial meltdown scenario, any bank TPs will certainly be among the first securities jettisoned. The treasury auctioned the 5 year TIP yesterday. The coupon is .5%. With the OID, the yield would be .55%: www.treasurydirect.gov .pdf The five year non-inflation protected treasury was priced to yield 2.56% yesterday: Bloomberg.com: Government Bonds This indicates a break-even of about 2% which would be the market's current forecast of the average rate of inflation for the next 5 years. 1. Bought 100 of the ETF CDZ.TO at 19.24 CAD and 100 of the ETF CLF.TO at 20.10 CAD/Currency Risk Discussion (see Disclaimer) Both of these ETFs are offered on the Toronto exchange. Since I pay more in brokerage commissions to execute trades on the Toronto exchange (16 CAD), I am less likely to trade these two ETFs for small profits. The primary purpose for buying them was to increase by exposure to the Canadian dollar through the purchase of securities that pay dividends in Canadian dollars and to further diversify my holdings. I came across these Canadian ETFs by performing a search for the web address for Claymore ETFs and accidently clicked on the link to Claymore's Canadian site. I knew that I made a mistake after arriving, but decided to take a look around to see how the offerings differed from the ETFs sponsored by Claymore which trade in the U.S. The Old Geezer was interested in several of the ETFs offered on the Toronto exchange. The ETF CLF uses a ladder strategy to buy Canadian government bonds. The ladder is weighted into five equally weighted baskets, with maturities of 1 to 5 years. So, while I face currency risk, my interest rate risk is limited since there is a constant roll in bond maturities. Claymore 1-5 Yr Laddered Government Bond ETF - CLF - Claymore Investments, Inc. The ETF has 25 securities with a duration of 2.535 years. Dividends are paid quarterly. The last distribution was 21.2 Canadian cents per share. At that rate, the current yield would be 4.21% annualized. I would expect the 15% Canadian withholding tax to be applied to the distributions. Management fees are .15%. Since I maintain a Canadian currency position anyway, I am always looking for ways to diversify my Canadian dollar position to generate income payable in Canadian dollars, which I will then use to buy additional securities that do the same. I am a long term holder of Canadian dollars, recognizing and understanding the currency risk. It goes without saying that the currency risk could easily wipe out the value of the dividends for a U.S. investor having to sell a position after a serious decline in the Canadian currency against the U.S. dollar. I am willing and able to assume that risk since I do not need to sell and can certainly hold the position until I receive a more favorable exchange rate. So far, my investments in Canadian dollars have worked out, as the Canadian dollar has risen in value against the U.S. dollar. I could now liquidate all of my Canadian holdings, convert the proceeds to U.S. dollars, and make a return just on the currency exchange. I do not intend to make that exchange for the foreseeable future. If I could convert at some point where a Canadian dollar would buy $1.2 U.S., I would have to consider making the exchange then. And RB said that all of this is in furtherance of its secret plan to acquire Canada, all of it. It is good to have goals, RB added with emphasis. HK just said for the RB to hush, that plan is secret. The price may go up if the Canadians get wind that the HK is gradually acquiring their nation. The other Canadian ETF CDZ:TO is designed to replicate the S & P/TSX Canadian Dividend Aristocrats Index. Claymore S&P/TSX Canadian Dividend ETF - CDZ - Claymore Investments, Inc. Management fees are .6%. Dividends are paid monthly. The current dividend yield is around 4.95% (excluding withholding tax and currency exchange values). The ETF contains 56 securities and a list of them can be found at Claymore S&P/TSX. I also mentioned an Ishares product,EWC, which is an exchange traded fund available in the U.S. when I purchased shares at $15.55 in March 2009. This one pays semi-annual dividends. Distributions. EWC is based on the MSCI Canada Index: iShares MSCI Canada Index Fund (EWC): Overview While this fund is denominated in U.S. dollars and sold on a U.S. exchange, a U.S. investor in EWC also faces currency risk as the securities contained therein are after all Canadian stocks. I would add that CLF is available for trading in the U.S. on the Grey Market: Claymore 1-5 Year Laddered Government Bond ETF - CLFMF. For those unfamiliar with this market, it is very difficult to trade, but it is possible. The main problem is that there is no transparency. The bids and offers are not displayed. There are no market makers. OTC Market Tiers, OTCQX, Pink Quote/OTCBB, OTCBB, Pink Sheets, Grey Market, Caveat Emptor Limit orders have to be used. I have entered orders in the Grey Market and have had difficulty receiving fills. I therefore just prefer going to a market which has transparency which was the Toronto market for the ETF CLF. 3. MYP (own): MYP is a principal protected note issued by Citigroup Funding and guaranteed by Citigroup. I bought 100 shares at $10.12. As mentioned in that post, I knew then that the first annual coupon period had experienced a reversion to the 3% guarantee due to a maximum level violation. I mention MYP now simply to highlight that the first annual coupon period ended April 26, 2010 with the S & P 500 closing at 1212.05,^GSPC: Historical Prices for S&P 500 INDEX . The prospectus states that a "coupon period will begin on the last index business day of the preceding coupon period," Pricing Supplement The starting value for the second coupon period would then be the closing value of the first period, which was 1212.05. This means that the S & P 500 can not have a single closing day over 1,599.906 without causing a reversion in the second annual coupon period. The maximum level for an increase in the S & P 500 is 32% from its starting value. As long as there is no maximum level violation during the relevant coupon period, one day is enough, then the owner of MYP would receive the greater of 3% or the percentage increase of the S & P 500-up to 32%-from the starting value to the closing date. The next closing date is April 25, 2011. Assuming Citigroup survives to pay the $10 par value in 2014, my downside is the small premium paid to par value and the 3% guarantee, while the upside would be an annual distribution between 3% and 32%. I will receive my first coupon payment based on the guarantee on 5/3/2010 (i.e. $30 for 100 shares). 4. Bought 50 FNB at $9.36 (Cat. 2-Regional Bank Stocks) (see Disclaimer): FNB was scheduled to report after the close of trading yesterday. If I was going to buy more than 50 shares, I would have waited to review the report. FNB is the replacement for Synovus which was sold after one too many disappointing quarterly reports. F.N.B. Corporation is the holding company for First National Bank of Pennsylvania (FNBPA). As of 12/31/2009, it had 224 community bank offices in Pennsylvania and Ohio, and 57 consumer finance offices in those states along with Tennessee. It had 3 commercial loan offices in Florida and 1 in PA. The Florida offices focus on managing the loan portfolios acquired in that state from prior years. The annual dividend rate is currently 48 cents per share, which translates into a 5.13% yield at a total cost of $9.36. I would not be surprised by a dividend cut. The bank did cut its dividend in half during the Near Depression period, reducing it from 96 cents annually to the current 48 cent annual rate. On the bright side, the bank did remain profitable during the recession, though earnings did decline substantially from 2007. The bank did redeem the government's preferred stock in September 2009. The bank sold 24.15 million shares at $5.5 a share in June 2009. The net proceeds were 125.8 million dollars. The bank has operations in Florida which appear to me to be a disaster. The non-performing loans in Florida were a truly horrendous 31.65% of total loans in that state. I do not know the origins of the foray into Florida. Fortunately, the Pennsylvania operation is much bigger and had non-performing loans at .85% of total loans as of 12/31/2009. (page 49: e10vk). What can you say? Just another bank that got away from its roots and thought they would find the city of gold in the sunshine state. The net interest margin was 3.75%. The bank earned just 4 cents per share for the Q/E 12/09. After the close F.N.B. Corporation reported an E.P.S. of 14 cents per share, beating the consensus estimate by 2 cents. The total risk based capital ratio was 12.8%, the tier 1 risk based capital ratio was 11.4, and the leverage capital ratio was 8.7%, all as of 3/31/2010. The net interest margin was 3.74%. 5. SOLD 100 HSE:TO AT 30.48 CAD (SEE Disclaimer): Husky Energy was bought recently at 28.99 Canadian. I received one quarterly dividend payment. This transaction leaves me with over a 3 thousand Canadian dollar surplus which I intend to invest into two more of the Claymore Canadian ETFs. The Canadian dollars do not earn anything sitting in the brokerage account so I will put them to work again soon. RB just said that this is typical LB tunnel vision. RB bets that the NERD buys the Canadian ETF for corporate bonds and another containing Canadian preferred stocks (mostly TPs). How on earth is the HK going to acquire Canada with those kind of investments? The bad debt expense increased to 12.4% of revenue from 12% in the year ago quarter. If the republicans are not successful in repealing the recently passed health insurance bill, which is one of their primary goals, this bad debt problem will not likely be a serious problem starting in 2014, and certainly nothing like 12% of revenues. 7. Sold Two LTs ACTI at $3.19 and RCMT at 3.53 (See Disclaimer): Headknocker is not being reasonable when making the request that LB work more than 24/7. Even when other staff member are sleeping, the LB is working, mulling the one million or so variables and contingencies that impact its decisions. The LB is at its limit and does not believe it is possible to work more than 24/7. As a consequence, LB refused to buy yet another regional bank stock advocated by the RB unless LB could sell two Lottery Tickets. Hence, to appease the LB, and to lighten its work load, the decision was reached to jettison ACTI bought at 2.20 and RCMT purchased at $2.15. RB acknowledges that it was behind those LT buys, but wants everyone to know that it voted for buys of 10,000 shares each. It was the LB that wanted only 50 shares. 8. UBSI (own-regional bank strategy): I was curious when UBSI would start to correct. The stock closed Friday at $31.54, up from my purchase at $16.56 last November. I like the dividend yield at my cost which is about 7%. UBSI fell $1.47 yesterday to close at $30.07 after reporting its 1st quarter results. The estimate was for 40 cents. UBSI: Analyst Estimates for United Bankshares, Inc.
Before the market opened yesterday, United Bankshares, Inc. announced earnings of 40 cents per share. NPLs were 1.29% of loans. As of 3/31/2010, the risk-based capital ratio was 12.6% and the Tier 1 capital ratio was 11.3% (6% is considered well capitalized). The net interest margin was 3.65%.